LG President and CEO Wayne Park kicked off their CES press conference by reminding us that the brand’s presence in North America was launched a decade ago at CES. 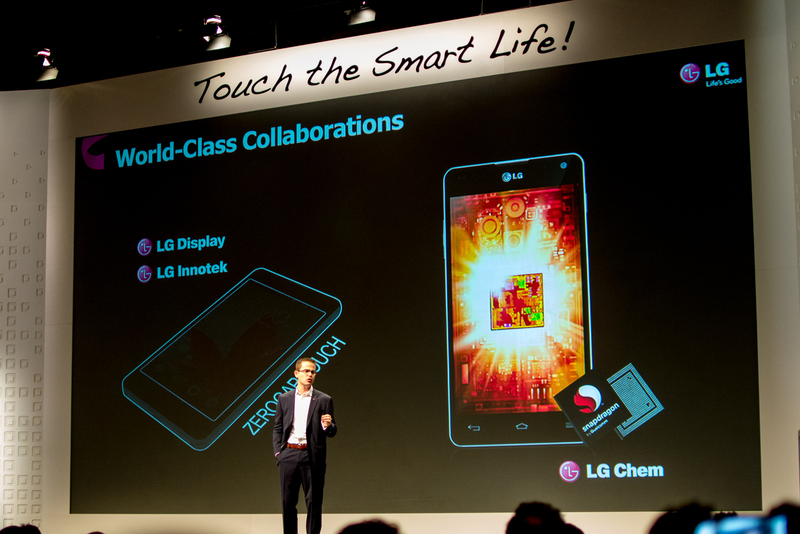 The company itself had been a presence in consumer electronics for sometime, but the LG brand was brought here just in time to catch the mounting wave of smartphones and other smart devices, and though we’ve seen them falter at times, they’ve consistently gained market share in some of the largest consumer electronics categories. In 2012, they had several important design wins, from the LG Google TV, to the Optimus G and Nexus 4. Worldwide they also saw a number of big wins in the mobile space with their phone/tablet mash-up the Optimus Vu and their L-series of mid-range smartphones. So, what do they have in store for us in 2013? The answer is a bit guarded, sadly. No new LG Mobile announcements are in store for CES; instead, we were reminded of the success they’ve had with the aforementioned G and Vu, and their successful collaboration with Google to produce the Nexus 4. They emphasized that their approach to software design is aimed at improving user experience through multitasking and feature adds that target a user’s interests. We’ve always found their skins a bit of an acquired taste, and there is pretty much universal preference for stock Android amongst AT editors, but we’ll give them some credit for trying. 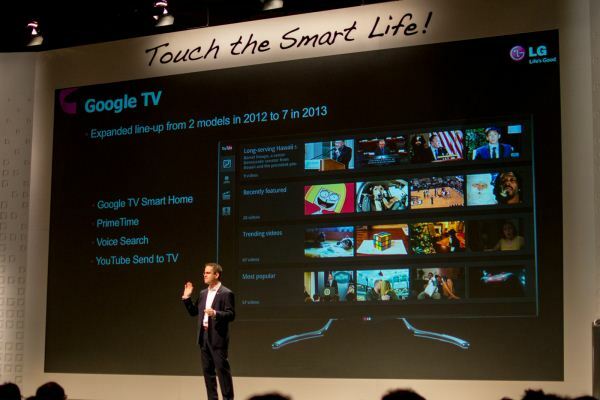 The other Android news involved their continued collaboration with Google for their Google TV powered Smart TVs. When the Google TV program was announced, we expected it to function as a tightly controlled ecosystem, with hardware and software specifications strictly laid out and enforced, and partners differentiating with changes in form factor and control paradigms. Think Windows Phone and not … you know, Android. What we’ve seen, though, has been something unique, and we expect this to change continue. No longer is Google TV a strictly defined thing, rather it is the implementation of search, recommendations and Youtube to build a television experience that seeks to break the old paradigm and provide a more “when you want it, how you want it” experience. And featured squarely in every Google TV device, will be Google’s content portal, YouTube. The success of Google TV will be up for discussion for quite some time. But Google and LG are putting some new tools to use to further their efforts in 2013. LG’s stable of motion control techniquesis expanding to provide even more control paradigms. Last year at CES, LG previewed a small gaming device that used cameras to implement Wii like motion control for causal gaming. The research they put in to these efforts are being put to use n their 2013 Google TV line-up for hand based gesture controls, first by allowing you to select a channel by tracing the digits with your finger. Despite the preponderance of video streaming options, the vast majority of television watching still happens through traditional broadcast and cable providers. So maybe there’s some dividend to be paid to providing a more “natural” way to switch between channels, than simply punching buttons on a remote. This will be in addition to the use of the Magic Wand remote control for pointing and click actions. 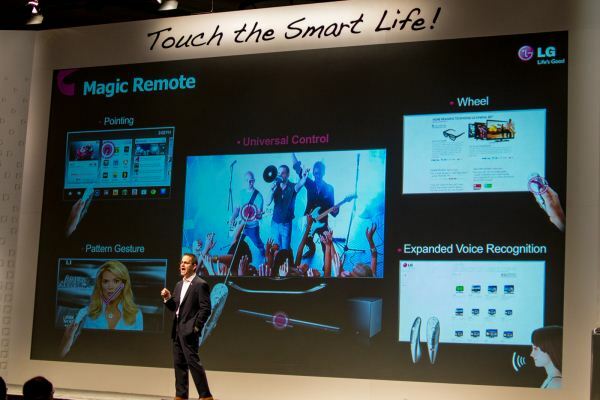 LG will also be refining the remote by bringing voice control into the remote itself. The impact on battery life could be considerable, since presumably an SoC will be housed in the device, and the results will be transmitted through Bluetooth to the set for action. The added benefit to this method is a move from command driven voice control (“Watch ESPNU”) to a natural language method (“I’d like to watch some college football.”). These are still early days in the evolution of the television, revolutionary talk not withstanding. Whether any of the techniques LG is implementing today will have any profound impact on the market is something to assess in years, not today or tomorrow, but we’re always glad to see someone trying, rather than leaving a market stagnant. We don’t cover televisions in any appreciable way, in part because they are commodities in the very worst way, with a tendency to drive to the bottom of the market. Our readers, though, will recognize some of the key tech being introduced this year. This year LG is bringing two TV technologies to the market, and realistically, these may be the first two technologies to justify a new set in a long time. First, we have the long (long) awaited introduction of “mass market” OLED televisions. 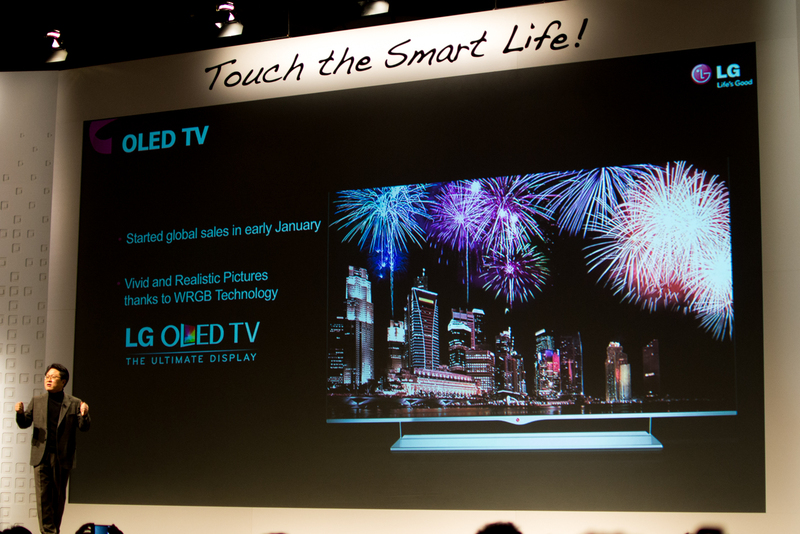 LG will bring its 55” OLED 1080p 3D Smart TV to the US this March, for a recommended price of $12,000. While that cost prohibitive price will keep it off shelves at your local Walmart or Best Buy, it is distinctly in the realm of reason for A/V enthusiasts. If LG’s OLED fabrication techniques are ready for that market, then it is possible we could see similar sets landing on big box store shelves within a few years. 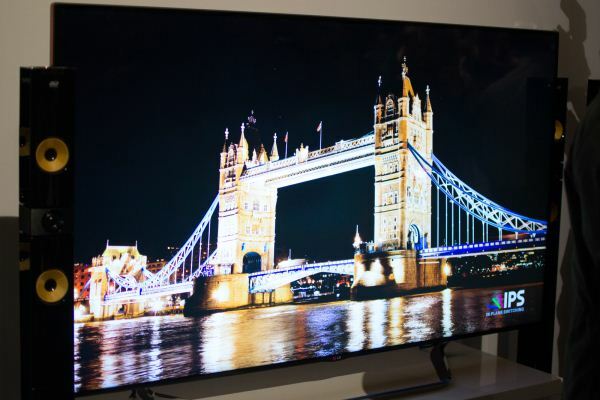 The other big reveal for CES 2013 is production sales of their 84” UltraHD sets, and two new sizes (55 and 65”) being introduced. Pricing wasn’t provided, but sales should start in March. 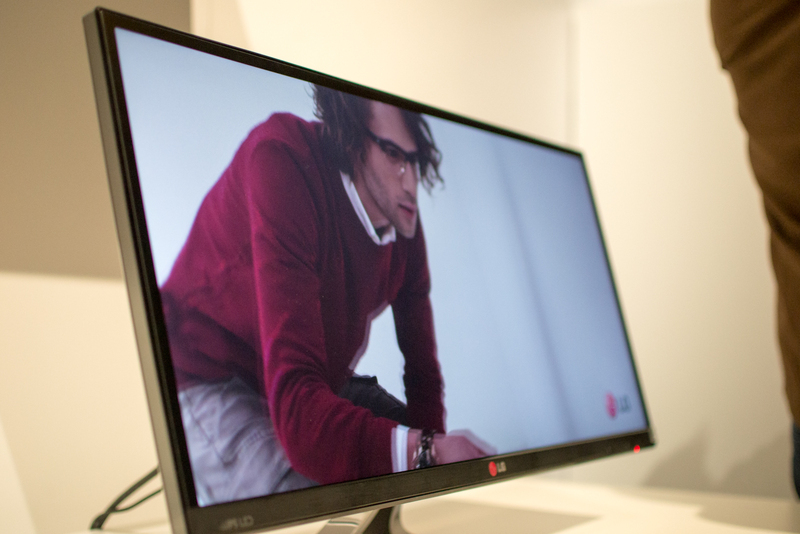 Lastly, we’ll take a quick look at LG Display’s latest plans for computer displays. LG has proven that they are willing to push themselves when it comes to risky design and feature choices, and they’re planning on continuing that push in 2013. LG will expand their line-up of 21:9 ultra-widescreen displays, providing added screen real-estate for professionals and gamers alike. They’ll also be expanding their 2560x1440 (WQHD) offerings, something that’s sure to curl the toes of our Ian Cutress, our Senior Motherboard Editor. The technologies that are bringing HiDPI displays to our phones and tablets are sure to make an impact in the computer display space, and this could be the year that we usher in an era of similar computer displays while bidding adieu to the cheap 1080p panels that have plagued us for so long. Touch displays will also be on offer from LG, though some of the samples we saw at the brief demo were a bit glossier than I would consider ideal. The show is just getting started, we’ll try to get some more hands-on time with all that LG has at the show shortly, for now, stay tuned. "..commodities in the very worst way, with a tendency to drive to the bottom of the market." They’ll also be expanding their 2560x1440 (WQHD) offerings, something that’s sure to curl the toes of our Ian Cutress, our Senior Motherboard Editor. They didn't mention screen sizes, but by highlighting diversity in the wqhd space I imagine we'll see several sizes as opposed to the 27" panels we see today. Ideally, we might see some 24" panels at affordable prices with decent features.